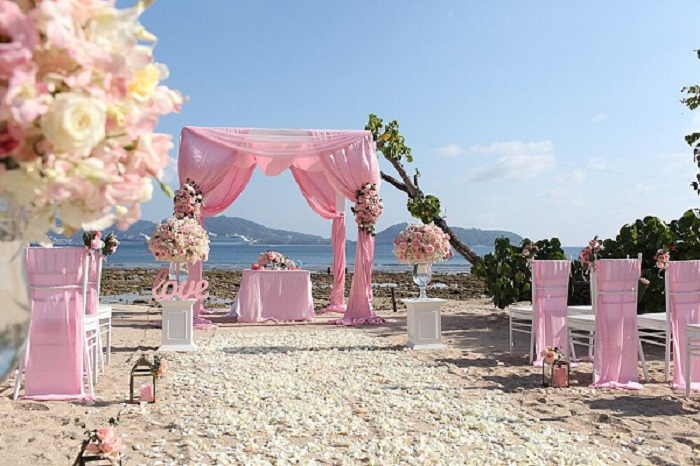 The all inclusive wedding package is the most exclusive of all our beach weddings in Phuket and a perfect choice for today’s busy brides. 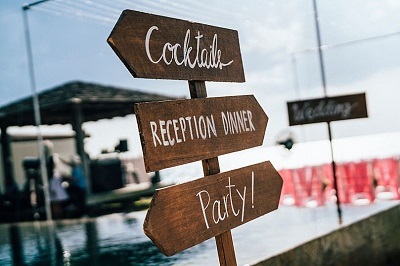 For a truly romantic and a totally stress-free wedding the all inclusive package includes everything from start to finish. 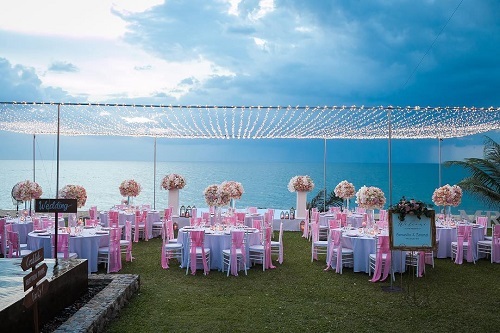 Most importantly it offers an affordable solution for couples planning a destination wedding in Phuket without the stress of breaking the budget. The all inclusive package can be held at many different venues across Phuket including beautiful beachfront resorts or trendy beach clubs. On the day of your ceremony, a make-up artist and hair stylist will meet the Bride and her Bridesmaid at your resort, to style the bridal parties hair and apply make up. When ready the bridal party and all the guests will then be transferred to the beachfront location, where the ceremony will take place. 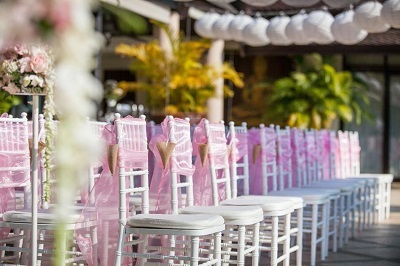 This all inclusive wedding package includes beautiful decorations with an abundance of fresh cut flowers, tiffany chairs draped with a coloured sash of your choice. Flower stands will line the isle to the alter and an arch of fresh flowers. 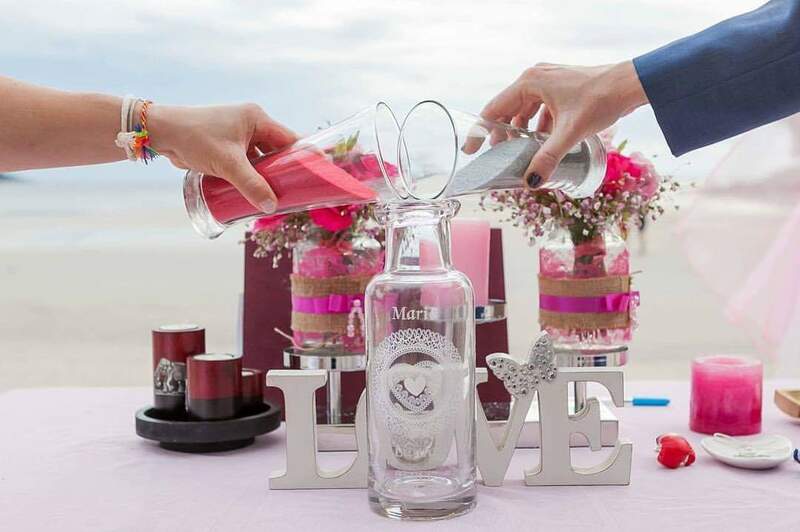 This package includes a ring and unity ceremony, where the happy couple will pour sand out of two glasses into one bottle to symbolize their union to one another. The ceremony is followed by the signing of the wedding certificate. The professional photographer is always around and covers every step of your special day. After the ceremony the photographer will take portraits, as well as group shots of your family and friends. Following the photos you will continue the celebrations at your reception venue for post ceremonial celebrations and a cake cutting ceremony. 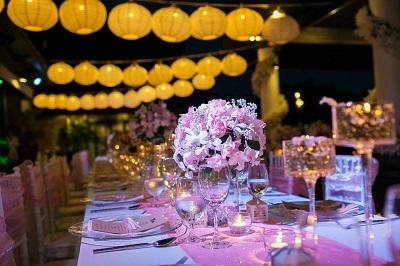 The wedding planner can assist you in finding accommodation for the Bridal party and your Guests. 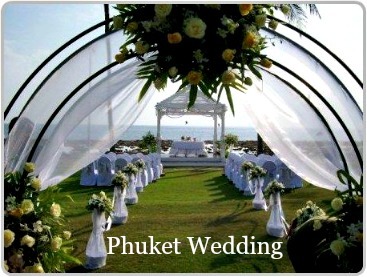 She can also organise airport transfers for your arrival into Phuket. As well as offering guided tours and activities for you and your guests after the celebrations are over. 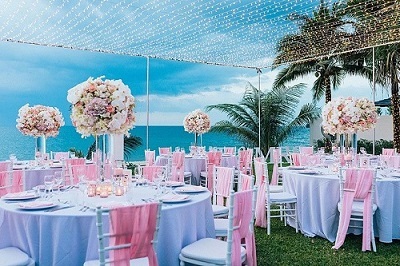 For further information about this all inclusive wedding package or for other ideas for a tropical beach wedding in Phuket please complete the following contact form. If you would like the planner to book accommodation with this package, please request this in the contact form below.